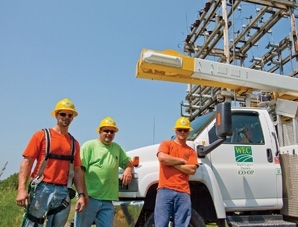 Founded in 1939 to bring electricity to rural Vermont communities and to provide our members with a voice in their energy future, Washington Electric Co-op today unites our founders’ pioneering spirit with a commitment to our environment, our communities and to our member/owners. Committed to providing energy from clean and renewable sources, and to helping our members use energy efficiently and wisely. Committed to providing reliable and safe service throughout our rural territory. Committed to involving, informing and educating our members. EMPLOYMENT OPPORTUNITIES – None at this time. 2019 Rate Increase Notice filed for 5.49% rate increase to begin January 1, 2019. For comments or questions regarding WEC’s draft Integrated Resource Plan please contact us at 802-223-5245 or wecMembers@wec.coop. Review the archives from WEC’s ENERGY COACH, or contact the Coach here A library of Energy Efficiency Ideas for you. Stay informed about what is happening with your home’s electricity service.